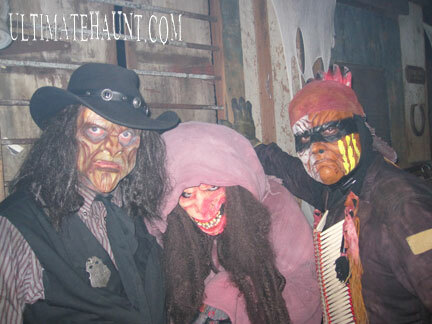 Click here for pictures of some of the horrific features at the 2010 Knott’s Haunt! FALLOUT SHELTER (IN 3D): The official description: Locked in a cement grave for decades, hidden deep below the depths of the lake, an abandoned “Fallout Shelter (in 3D)” is crawling with human /genetic hybrids, toxic mutants, and a host of nuclear freaks all hungry for carnage. Grab your Geiger counters and put on your radiation suits these residents are ravenous. Okay – you’re still here reading – you’ve been warned! From the front facade of the rockwork going into the shelter (complete with a huge vault door) is a great way to begin. 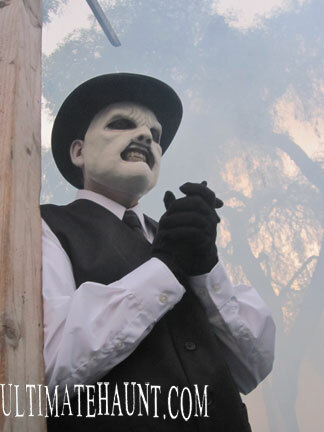 Furthermore, once inside the first room, the audio tracks describing what is happening via voice over completely set the tone – which appears to generally be a lost art in the world of Haunt – so it’s great to see it return. It is the attention to detail this maze has compared to several other mazes at Haunt this year that is a big difference maker for us. About halfway through the maze the 3D effects kick in that turn Fallout Shelter into a seemingly second maze altogether because now…all of the inhabitants become more and more mutated and the set pieces complement the ongoing chaos even moreso (with an almost tribute to movie, “The Thing”…for you fans of the movie, you’ll know what we’re referring to). The monsters throughout the entire maze just seem to get “it” – that “it” meaning in-character, aggressive scares that define this event. 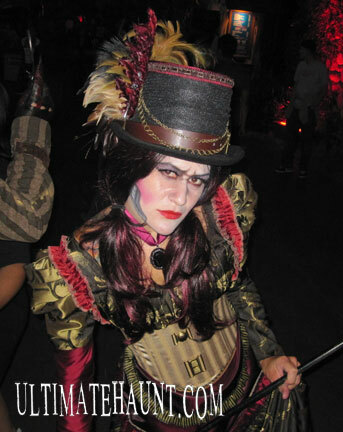 This maze (again, in our opinion) is what Knott’s Scary Farm’s Halloween Haunt is all about: Complete immersion with a full storyline that flowed-through 100-percent. To us, it doesn’t get any better than this folks – so dig it and appreciate it! 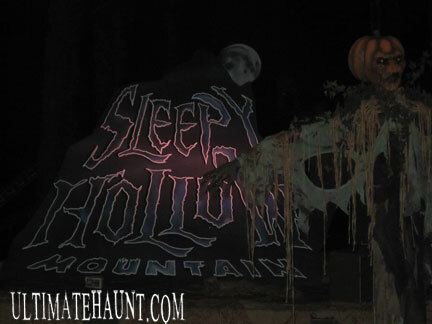 SLEEPY HOLLOW: The official description: Ghosts and ghouls, witches and goblins, long legged beasts and things that go bump in the night are all at your heels as you travel through the night through “Sleepy Hollow.” Specters and phantoms and legends of long ago haunt the living. 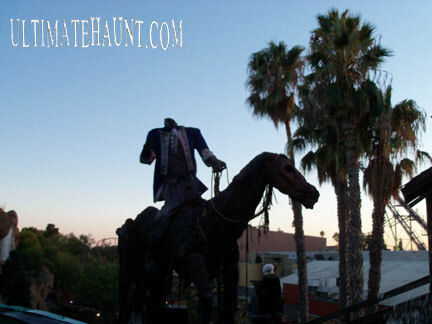 Can you outrun the Headless Horseman? Can you keep your wits, or will you lose your head as well? SLEEPY HOLLOW REVIEW: Ahhh…we had SUCH high hopes for Sleepy Hollow Mountain! 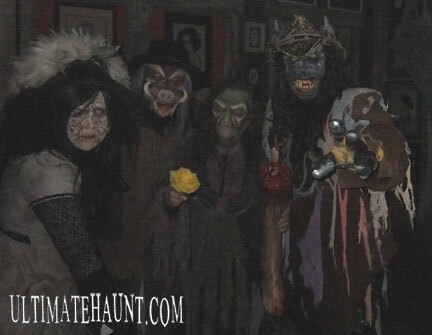 One side wants to be fair and give Sleepy Hollow Mountain another shot later on during the month – There were hardly ANY monsters when we went through (not one in the first room whatsoever?!). However, on the other side, paying good money, one would expect a good show at any given time, right? 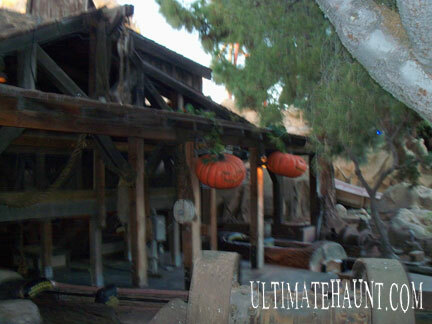 SO – we will give this another shot because the themeing was WAY better than Pyromaniax but not quite as intense as earlier renditions of Red Moon Massacre (or even Camp Gonnagetcha or Santa Claws Mountain, etc.). 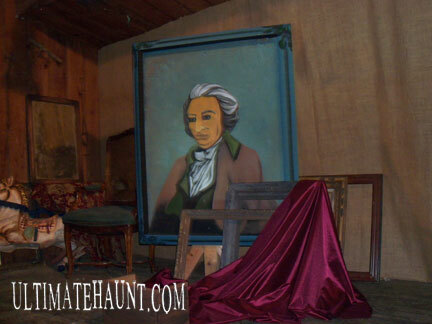 It was opening weekend – so we’ll let the monsters find their home and let the decor get situated and revisit Sleepy Hollow Mountain. 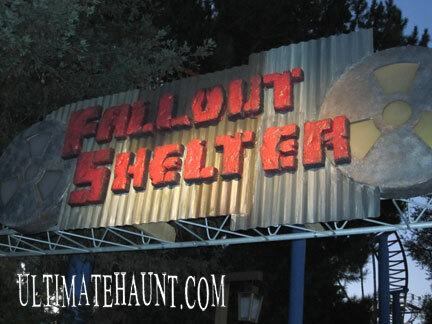 But realistically – if folks are paying good money for a quality show and in theory, this attraction should be up there with Fallout Shelter and Virus Z, right? ….Any reason why it isn’t – is well, quite frankly just an excuse. 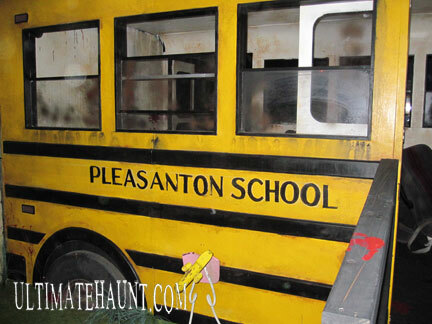 VIRUS Z: The official description: Welcome to Pleasanton – Population: Zero. The highly infectious “Virus Z” has turned the entire town into cannibal zombies and you’re this week’s special. Hordes of bloodthirsty corpses roam the small town in search of fresh meat. Help has arrived, but they are not on a rescue mission – they are here to wall off the entire town from civilization. VIRUS Z REVIEW: This maze was actually pretty cool. With the plywood cutout facades throughout made it almost feel as if it were more on the cartoon-ish side – but the sets are secondary compared to the monsters that have caught this virus. 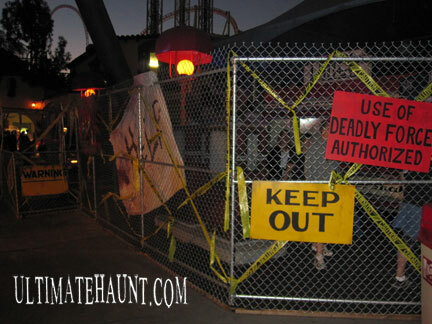 We won’t spoil the final scenes for you, but if you went through Quarantine (specifically in its debut year), you will see it’s very much like the second time going into the apartment complex of that maze – very chaotic and fun – filled with a lot of scares and terror! 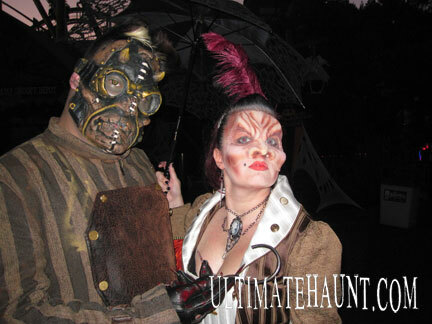 The bottom line for us was THE MONSTERS made this maze – they were just amazing and it was great to see just a good ol’ fashioned zombie-ish maze at Knott’s Haunt! Hit this maze SUPER early because the lines are going to be crazy – the layout of the maze is filled with tight corners that force you to go fairly slow (which is great to soak in the details of the set) but will result in a slow-moving line. LOCKDOWN: THE ASYLUM: The official description: The inmates really are running the asylum in this nightmare prison, “Lockdown: The Asylum,” and insanity reigns supreme. The inmates are out of their cells and their minds. And don’t scream for help, this hostile takeover has the authorities running for cover! LOCKDOWN: THE ASYLUM REVIEW: WOW! Out of all the returning mazes in 2010, Lockdown is definitely the best! What is it about this maze? Is the craziness that is a carry-over from Asylum? Who knows? What we do know is that this maze was AWESOME when we went through. We would just be repeating ourselves from last year’s review if we went on further describing scene after scene. If you liked Lockdown last year, you’ll love it this year! 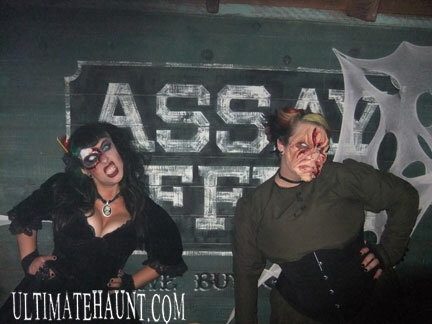 We had an absolute BLAST! Enjoy!! TERROR OF LONDON: The official description: Step back in time and into the fog-filled streets of London where a host of infamous characters are on the prowl terrorizing city dwellers. Step lively or you may fall victim to Jack the Ripper’s blade or Dr. Jekyll’s twisted experiments as Big Ben rings out in “Terror of London.” God save the Queen…..and you! TERROR OF LONDON REVIEW: Ouch….well, unfortunately, Terror of London is starting off like it did in 2009 – very flat. 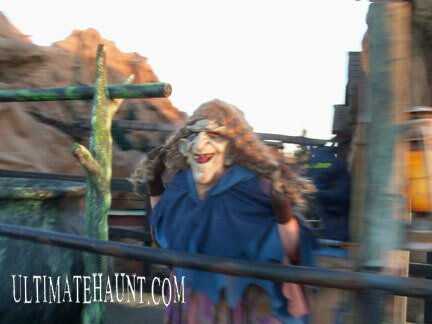 The maze still looks wonderful and the monsters are well….just there for about the first 2/3 of the maze. The last part of the maze definitely picked-up and the monsters were VERY energetic and scary. Hopefully it was just the opening weekend jitters – we’ll revisit and see if there is a positive difference later on in the run. DIA DE LOS MUERTOS: The official description: Venture into the forbidden jungle of El Chupacabra where sacrificial blood rains down from the sky. The screams of La Llorona, the Weeping Woman, echo around you and the creatures of the night crawl from their crypts – “Dia de los Muertos,” the “Day of the Dead” has arrived! DIA DE LOS MUERTOS REVIEW: This maze was pretty much exactly what it was in 2009. 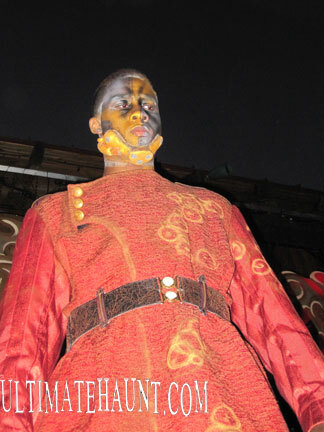 The sets and storyline (which we saw in the interview of designer, David Ortiz) were very cool looking. 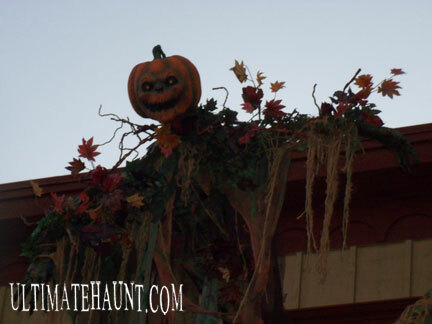 The hanging skeleton area was by far the coolest area in the maze – we LOVED it. If you went through this maze in 2009, go early so you don’t sit in a long line for it because you already know what to expect. 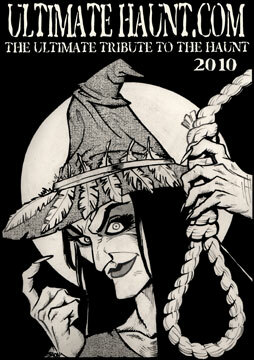 If you missed it in 2009, then head on over and dig the cool storyline of Dia de los Muertos! UNCLE BOBO’S BIG TOP OF THE BIZARRE IN 3D: The official description: Step right up! Don’t be shy! Welcome to “Uncle Bobo’s Big Top of the Bizarre in 3D.” Inside you will find a villainous variety of vaudevillian visages to vex even the most valiant voyeurs! 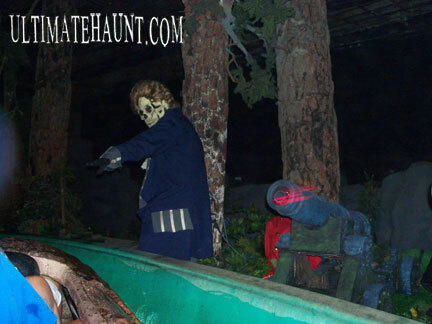 It’s the greatest slaughter on earth with clown carnage galore! 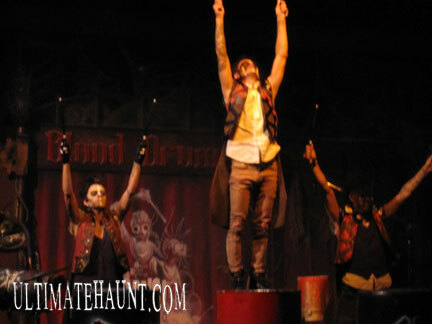 UNCLE BOBO’S BIG TOP OF THE BIZARRE IN 3D REVIEW: Much like Lockdown, there is something with these clowns at Knott’s Halloween Haunt. They were off the hook when we went through! There were clowns EVERYWHERE in Uncle Bobo’s. They were funny, scary and everything in-between. The 3D effects in all of the artwork are VERY cool – so if you have a chance – dig the sets and surroundings of this crazed maze! THE LABYRINTH: The official description: Enter “The Labyrinth” for a journey through a forgotten forest and into the dark catacombs that lie beneath a ruined castle. The evil king is dead, but his cursed court still haunts the dark passageways and mythical beasts come to life as you try to navigate the never-ending corridors. THE LABYRINTH REVIEW: Well, you either love this maze or not. We loved it and thought it was filled with creeped-out fantasy-based monsters that were very cool. From what we could tell, it was pretty much the exact same as it has been in the past (minus a very special person). 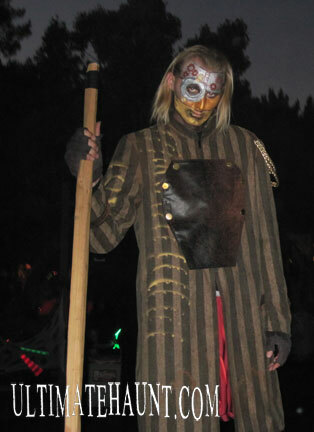 Beyond that, the monsters that were spread throughout The Labyrinth were very entertaining and the final ball room was packed full of twisted dancing monsters. So – if you liked it in the past, you’re in store for another entertaining experience – if you didn’t – we encourage you to give it another chance because we dug it! THE SLAUGHTERHOUSE: The official description: Folk’s from near and far come a-runnin for Farmer Willy’s world famous BBQ! You can smell the sizzling meat from miles away. And now you can learn his secret first hand as you enter “The Slaughterhouse.” Farmer Willy will think you are prime beef as he sets out to auction you off to the highest bidder, tenderize you with his chainsaw, and grind you into a tasty meat treat. Bon Appetit! THE SLAUGHTERHOUSE REVIEW: Yes – The Slaughterhouse – although the same basic theme is present – was entirely a different layout and very, very intense. 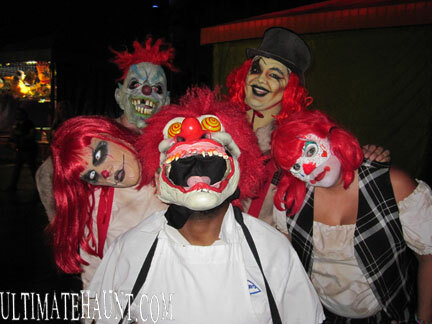 If you are looking to get SCARED (which, if you’re reading this website and love attending Knott’s Scary Farm), The Slaughterhouse is THE place for you! It appears to be FAR more long than the maze was in the past – which is great! The storyline is a bit lost compared to what it was in the past. Previously, it felt like you (the guest) were supposed to play the part of “live meat” going through your fate in a slaughterhouse. This upgraded version makes you feel as if you are touring an evil slaughterhouse. Either way – this maze is very intense and very sinister – and in our opinion – BETTER than what it was. Let us know if you feel the same way! BLACK WIDOW’S CAVERN: The official desription: “Black Widow’s Cavern” takes you to the heart of an abandoned mine overrun by a horrific pack of deadly arachnids. BLACK WIDOW’S CAVERN REVIEW: Not sure what happened here – but the Mine Ride was NOT at full strength when we went through. 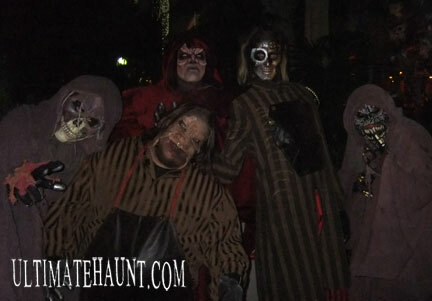 In fact, most of the monsters (count of 7) were in the Exit line scaring and not in the ride. 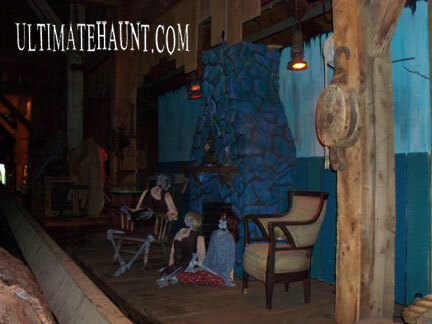 With that said, there wasn’t much going on inside the Mine Ride other than the props and special fx. Unfortunately, the main spider in the Glory Hole was completely exposed without any fog in there and therefore, all of the wires, etc. where there for all to see. A big difference (in a bad way!) from last year – a lot more fog helped to create a great atmosphere – in 2010 – not so much. Perhaps our timing was off and they were having a bad night? So what? – that’s not a reason for folks paying a lot of $$ to get a good show. Should you choose to go through Black Widow’s Cavern, do it EARLY because it is NOT worth a long wait unfortunately. THE DOLL FACTORY: The official description: A trip to “The Doll Factory” reveals a twisted museum of death and disfigurement as you are pursued by the Marionette Murderer, a psychotic killer who turns his beautiful victims into life-size porcelain dolls. THE DOLL FACTORY REVIEW: Ahhhh….poor old Doll Factory. 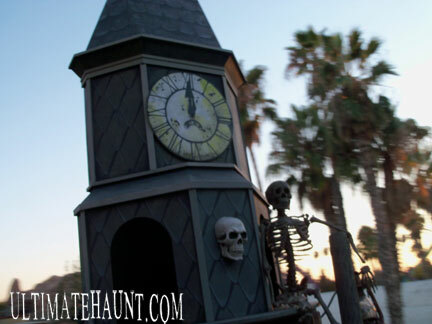 We know it’s currently the longest-running maze at the event – but wow….the energy and creepiness of this maze were a bit underwhelming when we went through. 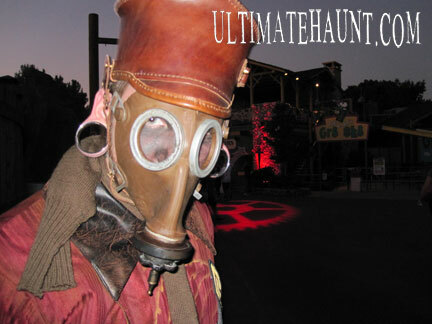 Much of the high-energy craziness that this former Ultimatehaunt.com Maze of the Year had a few years back has been lost over time. Perhaps (much like Terror of London) it was opening-weekend jitters and will improve over the run…? Who knows? Let us know if you agree or not. CLUB BLOOD: The official description: In “Club Blood” the music is hypnotic and the cocktails are bloody. In the dark underbelly of the city human victims are drained of their life to nourish the children of the night. 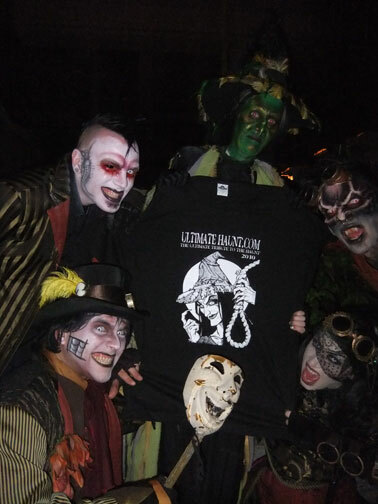 Join the hypnotic dance macabre and explore the darkest nightlife around. CLUB BLOOD REVIEW: Club Blood was actually quite good when we went through. Since we HIGHLY recommend spending quality time in Lockdown, you’ll end-up in Club Blood for a bit. It is primarily the same exact maze (from what we could tell) that it was in the past. The vampires, dancers, nurses, etc., etc….all of them come together in quite a disturbing, scary and fun way! CORN STALKERS: The official description: It’s harvest time and the crop is you in “Corn Stalkers.” Plunge into rows and rows of rotting corn and try to evade the blood thirsty monstrosities seeking to impale you on their razor sharp scythes. CORN STALKERS REVIEW: Much like the latest version of The Slaughterhouse, the latest version of Cornstalkers is different, more intense and way more improved. 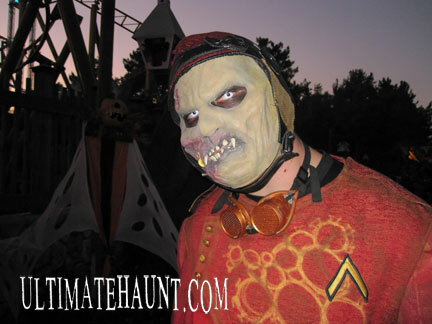 This maze was your vote for the Ultimatehaunt.com Maze of the Year two years ago and for good reason – it was scary! 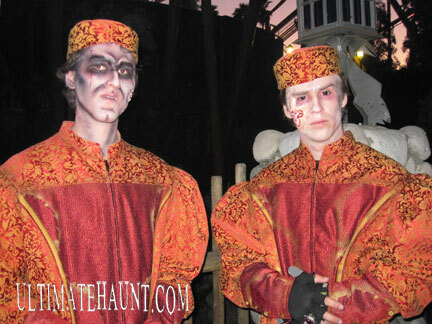 Something happened in 2009 and the maze lost most of its power and magic. However, the new and improved Cornstalkers went BACK to what it started off as – plain creepy! The set-ups, sets and locations for all of the monsters in the 2010 Cornstalkers is well thought-out – all having a very positive impact. If you went through Cornstalkers two years ago and were disappointed in 2009, you’re in for a real treat! We were VERY impressed! Who knows? Maybe it can once again be another dark horse! 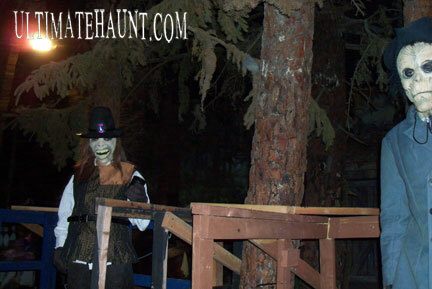 Pictures of some of the horrific features at the 2010 Knott’s Haunt!